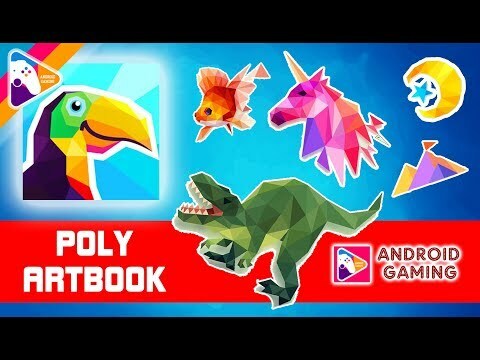 So, today guys I am here to present you a game called Poly Artbook published by Playgendary. And there is something good in the last few games and this is that a lot of puzzle games took on a new journey to find new variations of puzzles. And this means that the genre itself is evolving in a whole new way. The way of the thinking of these guys is more and more coming to me. I love puzzle games especially when they are so good and well drawn. As you could probably tell by the name, the game features poly artwork. Featuring a number of fun different puzzles, you’ll fit polygons into the right number boxes to create different scenes like a panda, bright parrot, rose, goldfish, and many more. And when complete, the puzzles will look like a 3-D model. Putting together the puzzles is an interesting experience, and is definitely relaxing. And now we are in the gameplay section and we will talk about the gameplay itself. After the puzzles are complete, you can share via Instagram quickly and easily. Poly Artbook is designed for the iPhone and all iPad models. It can be downloaded now on the App Store for free. You can also unlock a membership option via an in-app purchase of $7.99 per week, $19.99 per month, or the most cost-effective option of $99.99 per year. The subscription gives access to all poly puzzles and will remove all advertisements. You’ll receive access to a number of new poly puzzles. Basically, the gameplay is simple – you have to recreate the form of the picture by placing the correct figures on the correct places. It is really relaxing and fun. This is really a type of game that can chill your brain and get some positive energy from the great colors and figures. It is a little bit onesided, but hey this is a relaxing game so I think it should be that way. In the end, I want to say that this game definitely deserves a chance.